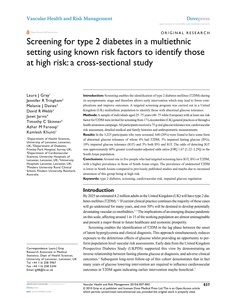 Introduction: Screening enables the identification of type 2 diabetes mellitus (T2DM) during its asymptomatic stage and therefore allows early intervention which may lead to fewer complications and improve outcomes. A targeted screening program was carried out in a United Kingdom (UK) multiethnic population to identify those with abnormal glucose tolerance. ethods: A sample of individuals aged 25-75 years (40-75 white European) with at least one risk factor for T2DM were invited for screening from 17 Leicestershire (UK) general practices or through a health awareness campaign. All participants received a 75 g oral glucose tolerance test, cardiovascular risk assessment, detailed medical and family histories and anthropometric measurements. Results: In the 3,225 participants who were screened. 640 (20%) were found to have some form of abnormal glucose tolerance of whom 4% had T2DM, 3% impaired fasting glucose (IFG), 10% impaired glucose tolerance (IGT) and 3% both IFG and IGT. The odds of detecting IGT was approximately 60% greater (confounder-adjusted odds ratios [OR] 1.67 [1.22-2.29]) in the South Asian population. Conclusions: Around one in five people who had targeted screening have IGT, IFG or T2DM, with a higher prevalence in those of South Asian origin. The prevalence of undetected T2DM is lower in South Asians compared to previously published studies and maybe due to increased awareness of this group being at high risk. © 2010 Gray et al, publisher and licensee Dove Medical Press Ltd.